The fastest transatlantic airliner flight was from New York JFK to London Heathrow on 7 February 1996 by British Airways’ G-BOAD in 2 hours, 52 minutes, 59 seconds from takeoff to touchdown. Concorde also set other records, including the official FAI “Westbound Around the World” and “Eastbound Around the World” world air speed records.On 12–13 October 1992, in commemoration of the 500th anniversary of Columbus’ first New World landing, Concorde Spirit Tours (USA) chartered Air France Concorde F-BTSD and circumnavigated the world in 32 hours 49 minutes and 3 seconds, from Lisbon, Portugal, including six refuelling stops at Santo Domingo, Acapulco, Honolulu, Guam, Bangkok, and Bahrain. The eastbound record was set by the same Air France Concorde (F-BTSD) under charter to Concorde Spirit Tours in the USA on 15–16 August 1995. This promotional flight circumnavigated the world from New York/JFK International Airport in 31 hours 27 minutes 49 seconds, including six refuelling stops at Toulouse, Dubai, Bangkok, Andersen AFB in Guam, Honolulu, and Acapulco. By its 30th flight anniversary on 2 March 1999 Concorde had clocked up 920,000 flight hours, with more than 600,000 supersonic, much more than all of the other supersonic aircraft in the Western world combined.On its way to the Museum of Flight in November 2003, G-BOAG set a New York City-to-Seattle speed record of 3 hours, 55 minutes, and 12 seconds. By around 1981 in the UK, the future for Concorde looked bleak. The British government had lost money operating Concorde every year, and moves were afoot to cancel the service entirely. A cost projection came back with greatly reduced metallurgical testing costs because the test rig for the wings had built up enough data to last for 30 years and could be shut down. Despite this, the government was not keen to continue. In 1983, BA’s managing director, Sir John King, convinced the government to sell the aircraft outright to British Airways for £16.5 million plus the first year’s profits. King recognised that, in Concorde, BA had a premier product that was underpriced. Market research had revealed that many customers thought Concorde was more expensive than it actually was; thus ticket prices were progressively raised to match these perceptions. It is reported that British Airways then ran Concorde at a profit, unlike their French counterpart. 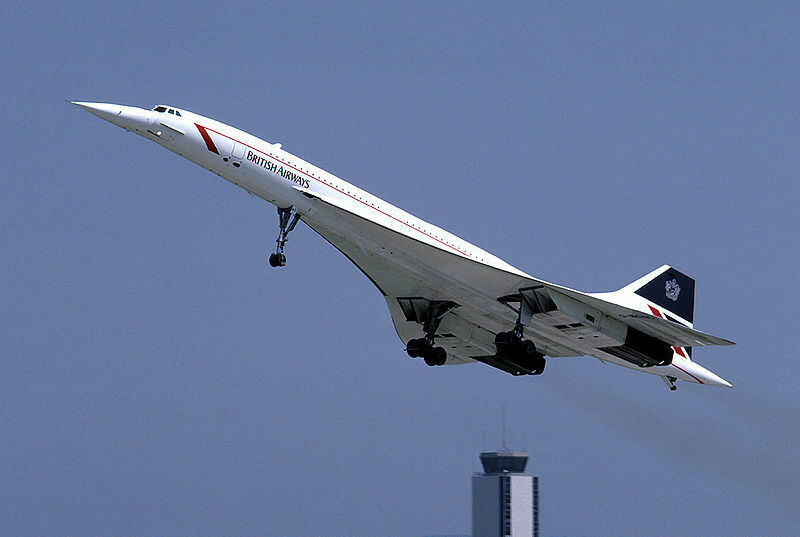 Between 1984 and 1991, British Airways flew a thrice-weekly Concorde service between London and Miami, stopping at Washington Dulles International Airport.Until 2003, Air France and British Airways continued to operate the New York services daily. Concorde routinely flew to Grantley Adams International Airport, Barbados, during the winter holiday season. Prior to the Air France Paris crash, several UK and French tour operators operated charter flights to European destinations on a regular basis; the charter business was viewed as lucrative by British Airways and Air France.In 1997, British Airways held a promotional contest to mark 10th anniversary of airline’s move into the private sector. The promotion was lottery to fly to New York held for 190 tickets valued at £5,400 each, to be offered at £10. Contestants had to call a special hotline to compete with up to 20 million people. On 11 April 2003, Virgin Atlantic founder Sir Richard Branson announced that the company was interested in purchasing British Airways’ Concorde fleet for their nominal original price of £1 (US$1.57 in April 2003) each. British Airways dismissed the idea, prompting Virgin to increase their offer to £1 million each. Branson claimed that when BA was privatised, a clause in the agreement required them to allow another British airline to operate Concorde if BA ceased to do so, but the Government denied the existence of such a clause.In October 2003, Branson wrote in The Economist that his final offer was “over £5 million” and that he had intended to operate the fleet “for many years to come”. The chances for keeping Concorde in service were stifled by Airbus’s lack of support for continued maintenance. Ithas also been suggested that Concorde was not withdrawn for the reasons usually given but that it became apparent during the grounding of Concorde that the airlines could make more profit carrying first class passengers subsonically it has been suggested that the Air France retirement of its Concorde fleet was the result of a conspiracy between Air France Chairman Jean-Cyril Spinetta and Airbus CEO Noel Forgeard, In addition A lack of commitment to Concorde was cited as having undermined BA’s resolve to continue operating Concorde. In 1985 Palmer recorded the album Riptide featuring the single “Addicted to Love“ which garnered him the Grammy Award for Best Male Rock Vocal Performance in 1987.The album also contained The singles “Hyperactive!” and “I Didn’t Mean to Turn You On”. In 1987 he released Heavy Nova and returned to experimenting, this time with bossa nova rhythms, heavy rock and white-soul balladeering. He repeated his previous success with the video of “Simply Irresistible“, again with a troupe of female “musicians”. The ballad “She Makes My Day” was also a hit. In 1989, he won a second Grammy for “Simply Irresistible” which was featured in the Tony Award winning musical Contact. Rolling Stone magazine voted Palmer the best-dressed rock star for 1990. The same year Palmer expanded his range even further for his next album, Don’t Explain, which featured the Bob Dylan penned single “I’ll Be Your Baby Tonight”, in a collaboration with UB40. He also released the Marvin Gaye cover “Mercy Mercy Me”. Throughout the 1990s, Palmer ventured further into diverse material and his 1992 album Ridin’ High was a tribute to the Tin Pan Alley era.